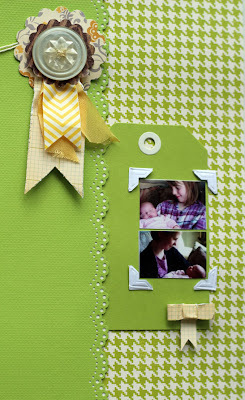 This is another NSD challenge from 2Peas National Scrapbooking Day weekend challenges. 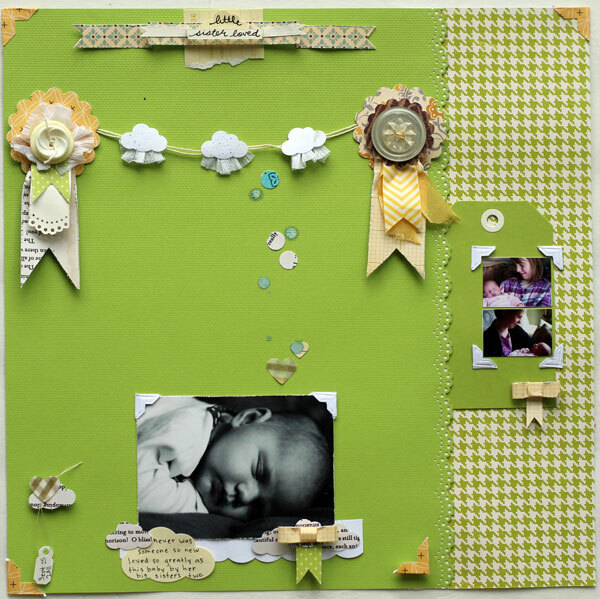 I made these layouts that week for the challenges, but it took me a little while to finish the journalling on some of them and photograph them properly, so that is why they are being posted here so much after NSD! For the "make it yours" challenge, I made my own fair ribbon embellishments out of punched patterned paper, paper strips, October Afternoon Flower Sack die cuts, buttons, and vintage seam binding. All of the patterned papers here are by October Afternoon. I love that green houndstooth, I think it was from Ducks in a Row. I handwrote the title on a cardstock banner and a cloud punched from cream cardstock. 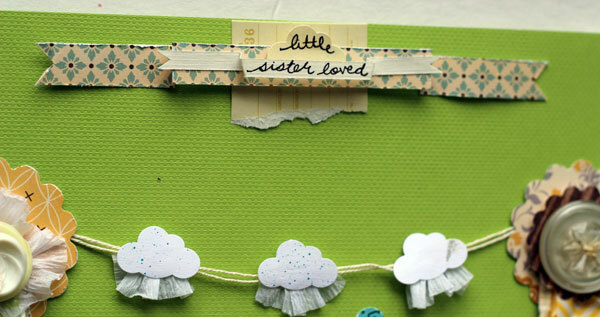 I love using index prints on layouts, they add a little context for the main photos and journalling, and act like little personalized embellishments at the same time. 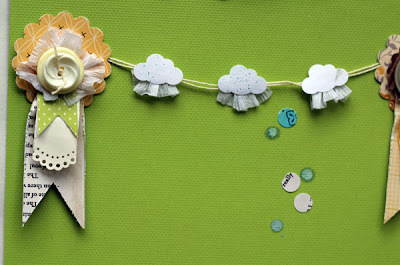 Here is a close-up of one of the fair ribbons. This one was made from punched Farmhouse patterned paper, crepe paper, buttons, washi tape, white punched cardstock, and a tail from Night Light Katie paper. Supplies: cardstock (Bazzill, Recollections); patterned paper (October Afternoon); die cuts (October Afternoon); punches (Fiskars, Martha Stewart); photo corners (Canson); washi tape (Bella Blvd); tags (Colorbok, Avery); pen (Sakura).